In the picture above, I am holding a Macintosh Portable, the spiritual ancestor of the MacBook Air. Well, that’s what I’m holding in my left hand; in my right, for reasons which will shortly become clear, I’m holding a sack of potatoes. Yes, the Macintosh Portable is the spiritual ancestor of the MacBook Air in that it took everything that was great about the Mac and made it portable, and it’s even true that the basic recipe of a screen, keyboard, pointing device, battery, CPU, and storage all wrapped up in a clamshell design is common to both—but the difference in weight is staggering. That’s an apt adjective, too, since unless you’re prepared for it, if someone hands you a Macintosh Portable you are apt to stagger a little as your center of gravity shifts unexpectedly. There was even a special case so you could sling it over your shoulder. Or at least haul it onto your shoulder with a grunt and a wince. The Macintosh Portable weighed—and, as my arms can attest, weighs—15.8 pounds, and much of that was because of its lead-acid battery. Lead-acid batteries, incidentally, are the things you find in cars, and when I say “cars” I don’t mean Priuses or Teslas. I mean the hulking great blocks under the hoods of traditional gasoline autos. 15.8 pounds, to put it in perspective, is the same as six MacBook Airs. In fact, stack six MacBook Airs on top of each other, with all their thickest ends at the same side, and they’re essentially exactly the same thickness as one Macintosh Portable. This big book? Nine of them in paperback form are as heavy as the Macintosh Portable. It’s also about the same weight as a couple of gallons of milk (that’s about 7.5 liters for those of us who’ve gone metric). 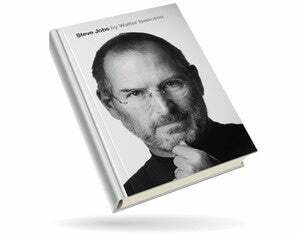 Or it’s about the same weight as nine paperback copies of Water Isaacson’s doorstop of a biography of Steve Jobs. Or about the same weight as 64 iPhone 5s. Or about the same weight as 138 Krispy Kreme Original Glazed doughnuts—and I think we should all pause for a moment to picture that. The Macintosh Portable, then, wasn’t portable in the sense we understand it today. It’s true that of course you could move it from place to place. It had a built-in carry handle, as you can see—a welcome feature Apple would resurrect with the eMate and the original G3 iBook—and there was even a special case for it so you could sling it over your shoulder. Or at least haul it onto your shoulder with a grunt and a wince. But if, back in the day, you were someone who did this regularly, commuting your Macintosh Portable daily to and from work, tell me in the comments and I will buy a hat for the express purpose of taking it off to you. Yeah, 15.8 pounds might not sound like much, but boy-howdy do you quickly start to feel it. The Macintosh Portable is as heavy as two of these, but at least carrying it won't make your hand cold. 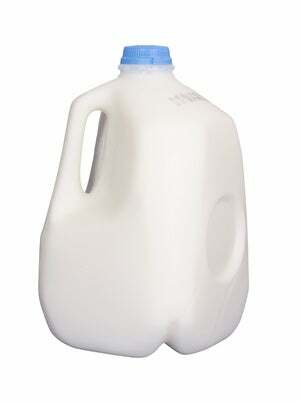 The next time you go to buy groceries, try holding a couple of gallons of milk, and see how long you can before things start to ache. (I know, I know; people will think you’re weird. But look, I stood in a park with my iPhone on a tripod repeatedly lifting a sack of potatoes and vintage computer hardware for you, so this is the least you can do for me.) It probably won’t feel bad at first, but after a few minutes—unless you’ve actually been going to, rather than merely being a member of, a gym—you’ll want to put them down. This isn’t just idle, foodstuffs-based fun. The fact that computers these days are so very portable—orders of magnitude lighter and more svelte, never mind more capable—drastically changes how, and how often, we use them. Even if the services, infrastructure and societal acceptance needed to tweet, send emails and flick through Tinder matches anywhere in the world had been there in 1989 when the Macintosh Portable was introduced, of course nobody really would have, because it was literally a pain in the neck to have one dangling from your shoulder wherever you went. 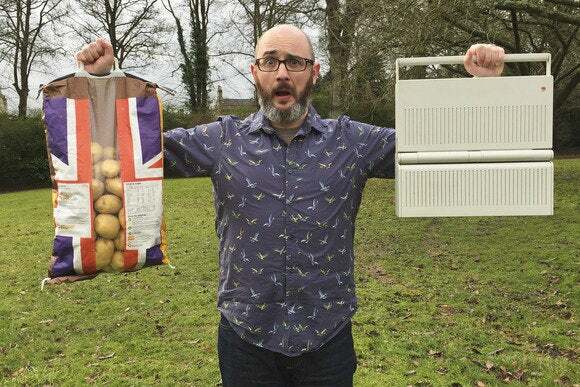 The image of carrying a sack of potatoes around with you because you need a computer is, of course, daft, but you have to ask yourself: what are we doing unthinkingly today that will seem equally silly a quarter of a century hence?